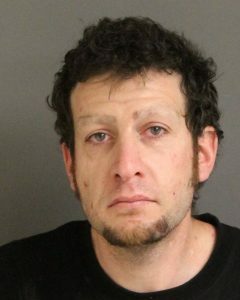 At approximately 7:00 a.m. yesterday, September 13, 2018, members of the AB109 Compliance Response Team (CRT) developed information that wanted Post-Release Community Supervision (PRCS) offender, 35-year-old Saam Massoudi of Santa Maria was hiding out at a home on the 1900 block of Estriga Ct. in Santa Maria. Massoudi had a no bail warrant for his arrest due to absconding from the terms of his probation. Massoudi is on probation for being a felon in possession of a firearm and possession of methamphetamine for sales. 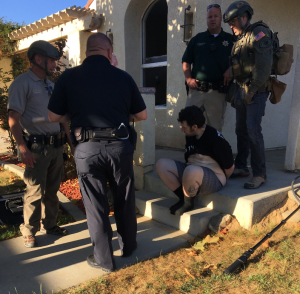 Additionally, Massoudi was the subject of a prior barricade at this same residence in October 2017, when he resisted law enforcement’s efforts to take him into custody on a prior arrest warrant. Based on CRT’s investigation, a search warrant was obtained for the residence to apprehend Massoudi. CRT was assisted by members of the Sheriff’s Special Investigations Bureau (SIB), Criminal Investigations Bureau (CIB), a California Highway Patrol (CHP) K9 team, a Sheriff’s K9 team and deputies assigned to the Santa Maria patrol station. Sheriff’s personnel forced entry into the residence and found Massoudi barricaded in a rear bedroom. Massoudi refused to comply with deputies’ commands to show his hands and remove himself from his barricaded position. Due to Massoudi’s non-compliance, a single less lethal foam munition was launched, striking Massoudi in his torso. Massoudi complied after being struck by the less lethal munition and was taken into custody. Massoudi was found to be in possession of methamphetamine, heroin and drug paraphernalia. He was treated at a local hospital for an abrasion and booked into the Santa Barbara County Jail for 148(a)(1) PC – Resisting arrest, 11350 HS – Possessing heroin, 11377 HS – Possessing methamphetamine, 11364 HS – Possessing drug paraphernalia, and his arrest warrant. He is being held without bail.